David Dickinson being orange, yesterday. David Dickinson was created in 1433 by students. He was invented due to the lack of Countdown and Richard Whiteley which were not due be released for another 6000 years. To keep themselves occupied until the arrival of Countdown and Richard Whitely the students created David Dickinson out of cider bottles, supernoodle flavourings, offal and choice pieces of the 70s. Since his release and due to popular demand David Dickinson has appeared over 12,000 times and continues to appear at regular intervals making him infinitly popular among students and people on the dole. David Dickinson is due to be decommissioned in the year 3020, this will make The Queen cry. David Dickinson enjoying himself on his antique farm and pointing at a fledgling antique. During the 70s, David realised that antiques were on the brink of extinction so to help save the antiques he set up the David Dickinson antique charity which is a farm on which he breeds antiques. After three years in captivity, David tags each antique with a tracking device and releases them in to the wild, thanks to David Dickinson's antique farm there are now an estimated 600 breeding pairs of antiques in the breeding in their natural environment. His most recent venture has been a stint as an oompa loompa. For those without comedic tastes, the so-called experts at Wikipedia have an article about David Dickinson. David has many catchphrases but his most famous one is "Cheap as chips!". When David spouts "cheap as chips!" at someone he means it quite literally, this is because David is constantly being ripped off by the man in his local chip shop. David usually ends up paying at least £60 000 for a bag of chips, thus, for David nearly everything is cheaper than or equal to the price of chips. His programme broadcast on Mars on January 27, 1993 served as an inspiration release of the Doom game, armed with only a pistol until that too was taken, due to a Bargain Hunt viewer winning it in a viewer's competition, the 95-year old correctly stating that David most resembled an oompa-loompa. This is when he was forced to stab the zombies with sticks and rods he found laying around. This is when he first came up with his second best catchphrase 'Cheap as sticks', which is what he is better known for on Mars. David managed to survive, and as a mark of respect his face replaced that of Doomguy at the bottom of the screen once the player had completed the game once. Dickinson tried to coin this catchphrase back on Earth, but it didn't work. 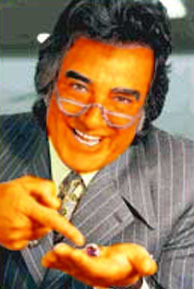 He was most upset that the Mega Drive and Super Nintendo versions could not fully replicate his orange face, and demanded he be removed from the game altogether, which made headline news on November 24, 1993. However, the sprite 'DDICK_FACE' can be accessed and implemented using an editing device. This also marked the first ever time David had dissed an antique. In early development he was planned to be the final monster in the game Doom II, which carried the sprite 'MONSTER_DICK' and the noise the monster would make when it notices Doomguy is 'SP_CHIPSTICKS', apparently a backwards, low-pitch version of David stating the catchphrases '"Cheap as Chips, Cheap as Sticks"'. His death sound was similar, 'SP_DEAFDICK' which was Dickinson moaning the words 'Death, bye Bargain Hunters.' David was intended to be very hard to kill, with an 1000% health start and his sticks caused at least 75% of damage. He was also intended to send plagues of zombified antiques after Doomguy, and a sprite 'AM_ANTIDICK' was made, but never put into the game. He was quickly removed from the game and was granted the role of the hero. However disaster struck in December 1993, the wake of Doom's release - when the alien sprite 'MONSTER_ANTIQUE', a large, grotesque spider-like robot monster which was flat and looked the same from whatever angle you were looking at it, got onto Earth and abducted David. 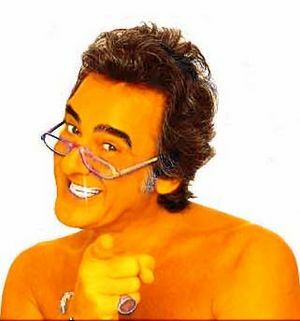 He returned in 2000 ready to host Bargain Hunt, more orange than ever before after allegedly being frozen in a tube of Orange Tango. 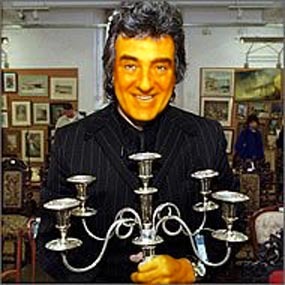 Orange David Dickinson holding an antique which he is just about to release in to the wild. When it comes to clothes, David likes to buy British. He has his suit woven from strand of his own horselike mane by a Manchester weaver woman and his shoes are cobbled with the finest of pygmy skin but when it comes to ties he prefers any sort of silk Italian ones. David has had the same hairdo since he was invented in 1433. Intially when he poked his orange head out from the inveting pot his hair was flat, limp, dry and had no body to it and so did all his other siblings. To identify him from the rest David's 'Mother', Doreen, carefuly and lovingly sculpted David's trademark hairdo using only a knife, clay and super glue. David prefers proper clothes, in fact, David likes proper clothes so much if he could see you right now he would probably say "Look at the state of you! Just look at you! Sitting there, lolling around in your jeans and those so called trainers! That tee shirt too, what a mess! Get your hair cut! You disgust me! What would the antiques says? You never thought of that did you?". He would then probably frog march you to his tailor and have you dressed properly. If David Dickinson left a door wide open causing a rush of air to chill you to the bone you would probably ask him if he was born in a barn, to which he would turn round and point at you and say "No, but I do live in one!". That's right! David Dickinson does live in a barn. After a hard day of herding and breeding antiques David likes nothing better than to perch up in the rafters of his barn and put his feet up while being pampered by owls. David never does any chores or cooking, he's just an old fashioned type of guy. Instead of cooking David prefers to dine on live mice which catches by swooping down on them from high up upon his perch, this is why David can regularly be seen coughing up furry pellets. This page was last edited on 24 October 2015, at 15:30.